Bone broth, which is made from animal parts (bones, tendons, skin, meat and other “scraps”) that are simmered in water for 3-48 hours, should be a permanent staple in your kitchen. 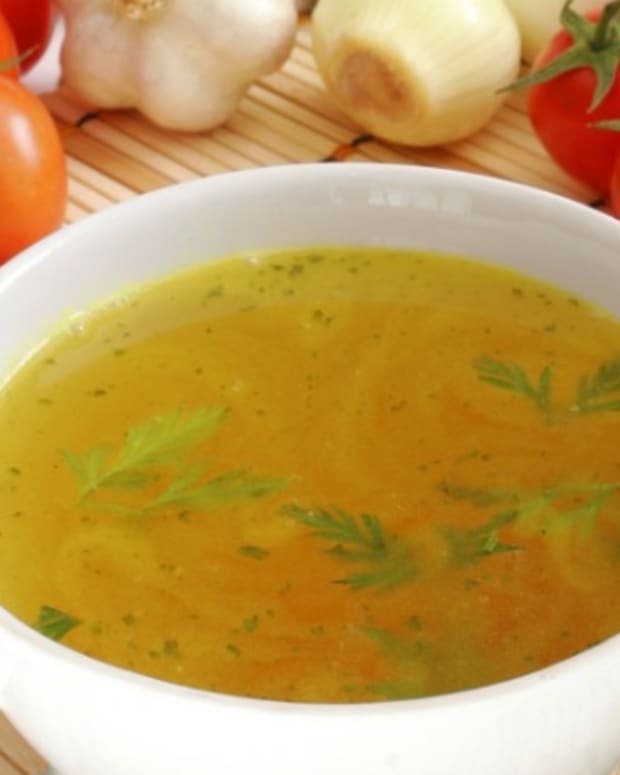 Keep reading to find out how to make your own broth, the health benefits plus ways to include it in your diet. In the 12th century, Maimonides stated that “boiled chicken soup neutralizes the body constitution” and that the concoction “can help cure an upper respiratory infection,” as well as serve as medication for leprosy, asthma, emaciation and for those convalescing from illness. 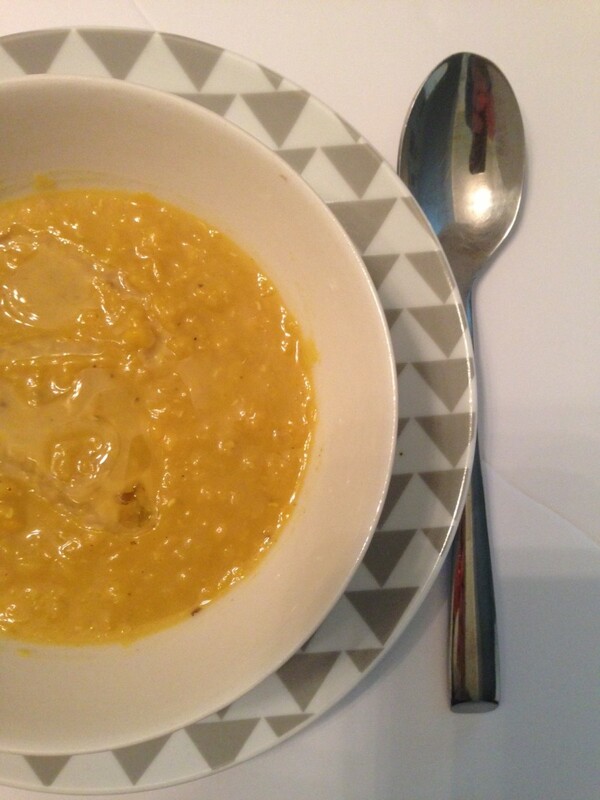 Yiddishe Mommes listened to the physician’s recommendation and hundreds of years later, it’s still dubbed as Jewish Penicillin. Traditional Chinese Medicine doctors also recommend bone broths to support kidneys, the digestive system and cell regeneration. Even the word “restaurant” derives from bone broths! These preparations were served to factory workers in inns in 18-century Paris during the Industrial Revolution. They were sold as restauratifs that made for quick, easy and strengthening meals. Eventually, the places where bone broths were available became known as restaurants. 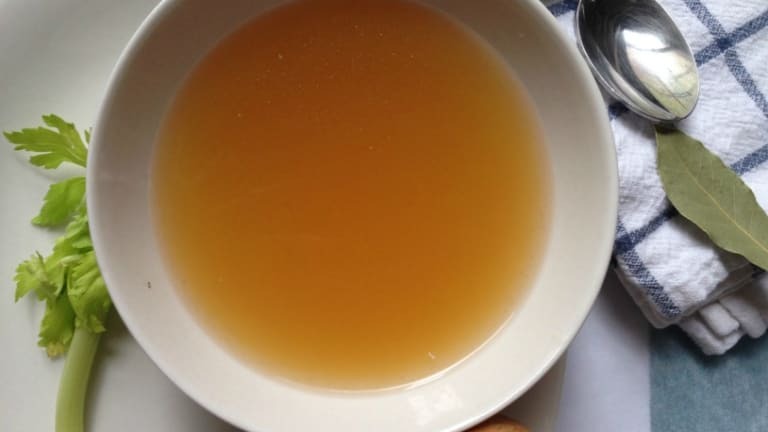 Current proponents of dietary protocols based on traditional foods such as Paleo, GAPS diet, functional medicine and Weston-Price all encourage the consumption of bone broths. They state that the process of slowly simmering (not boiling) bones and connective tissue (and sometimes meat as well) extracts gelatin from the collagen-rich joints, and the amino acid glycine. Collagen, which is the body’s most abundant protein, makes up bones, ligaments, cartilage, joints, tendons, and teeth. It promotes healthy hair, nails, and skin. When consumed as bone broth, collagen becomes easily digested and assimilated. Gelatin and glycine help protect and restore our intestinal lining (and even make our skin glow), and make nutrients more digestible. Making bone broth also releases minerals from the bones into the liquid, providing vital nutrients, and is especially helpful to prevent the negative effects of aging, stress and autoimmune conditions. The broth gets a gelatinous consistency when cooled, and that’s how you can see that the collagen has transformed into gelatin. I know…no one has time to stand up in the kitchen simmering bone broth for hours! That’s where slow cookers/Crock Pots become the perfect piece of equipment (besides your weekly cholent)! Bone broths freeze beautifully, once cooled, so you can make a big batch that can last for a long time if you freeze it into portions. 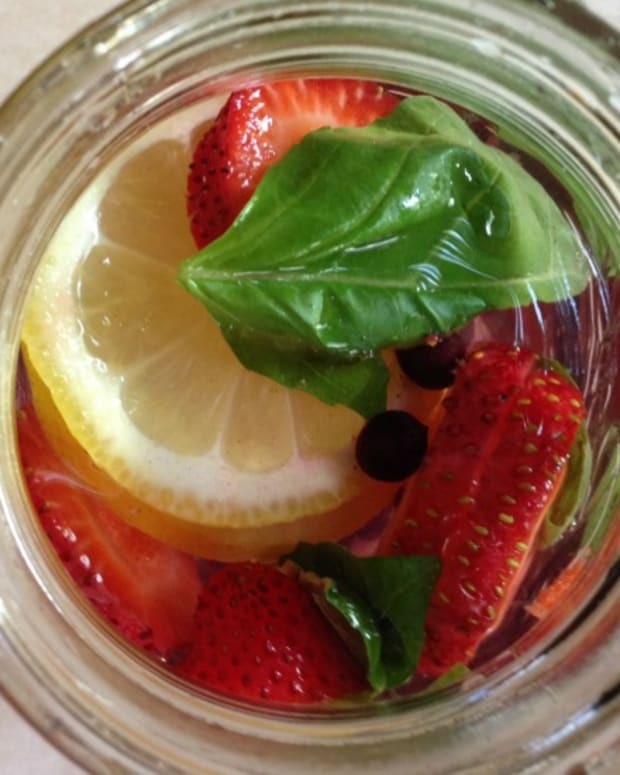 I like doing so in mason jars (nope, they don’t crack in the freezer). Plus, bone broths are economical- a little goes a long way. The bones and other animal products for the bone broth can be either raw or cooked (mainly roasted) when added into the liquid. Roasted bones, especially beef or lamb make for a more deeply flavored broth, but raw ones are also great. Some proponent suggest adding a bit of vinegar to the bones and water to help release the minerals into the liquid, however, some other experts say that this step is not necessary. I personally like the flavor of the small amount of vinegar in my broth, so I do use it. The origin of the bones/tendons is also important, and that’s why I suggest using the ones that come from pastured animals. I recommend using unrefined salt, such as sea or Himalayan, as they are richer in minerals; and a good amount of black pepper, as they are both indispensable for good flavor. The amounts need to be adjusted to personal taste, but do add some salt and pepper from the very beginning. 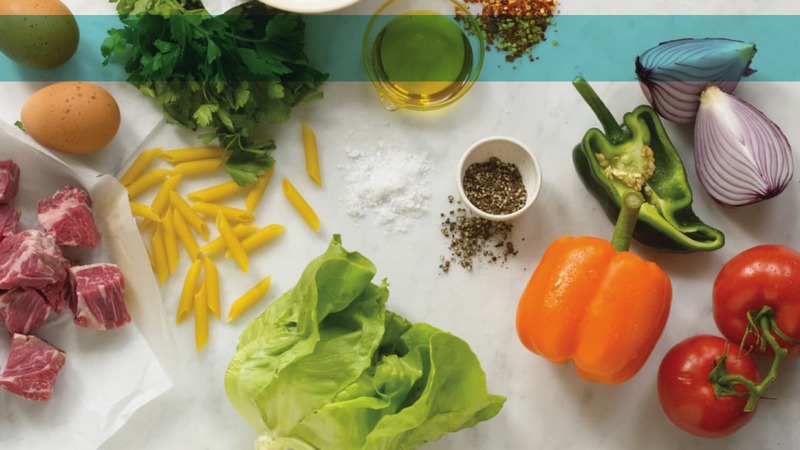 Vegetables and fresh herbs, including weekly scraps from cooking, are an excellent way of adding freshness, sweetness, and a more complex flavor. Vegetables and herbs should be added towards the end of the cooking process, (30 to 45 minutes before cooking time is done), then discarded once the broth is sieved through a fine mesh. Spices elevate bone broths and add extra phytochemicals and other good-for-us substances. Try adding some traditional spice blends such as curry, Chinese five spice, baharat or single spices into your bone broth. Turmeric enhances bone broths with its anti-inflammatory properties, ginger is a great anti-inflammatory and digestive aid, cumin, cardamom, saffron, cinnamon, the list goes on and on as so do the health benefits and flavor possibilities. 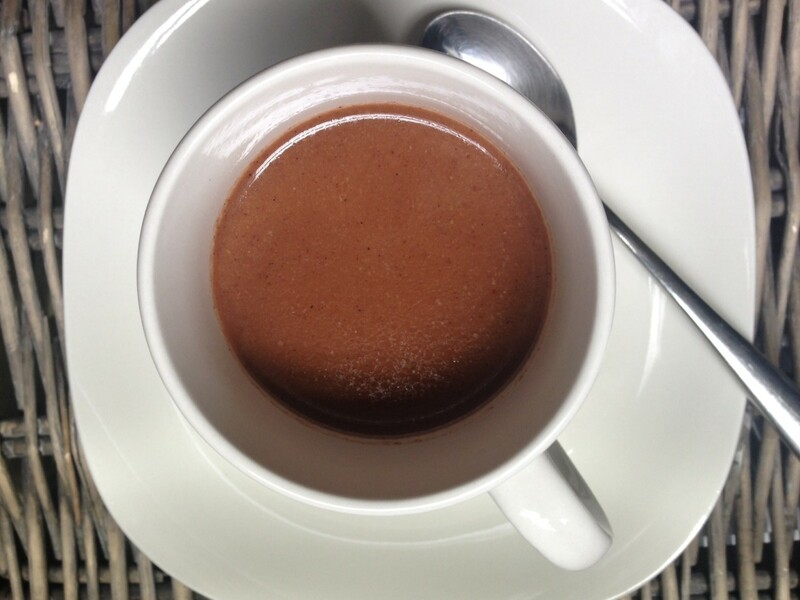 Medicinal mushrooms, such as immune-stimulant cordyceps, reishi and/or chaga can be a great addition to bone broths. So is maca root (which should be added right before serving, so it doesn’t cook) and even raw cacao powder, which is rich in magnesium. 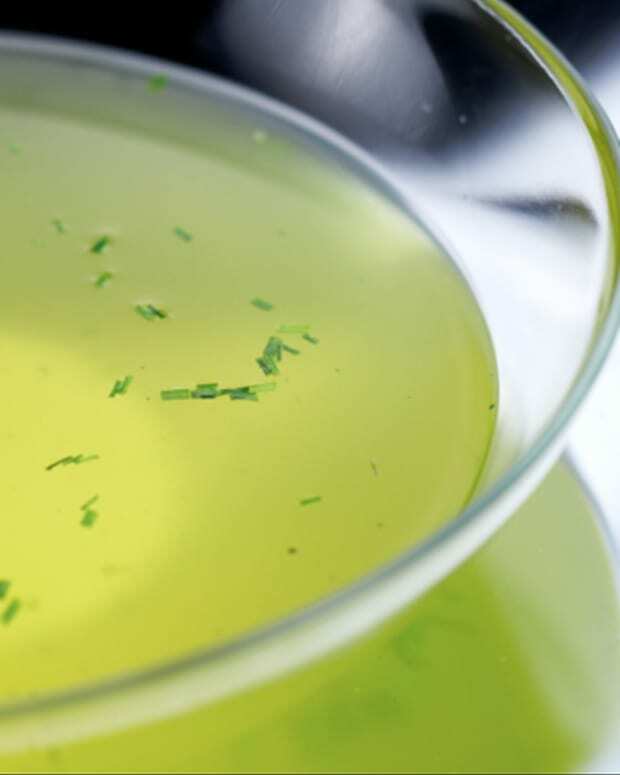 Matcha or other green tea can be a great antioxidant-rich addition. 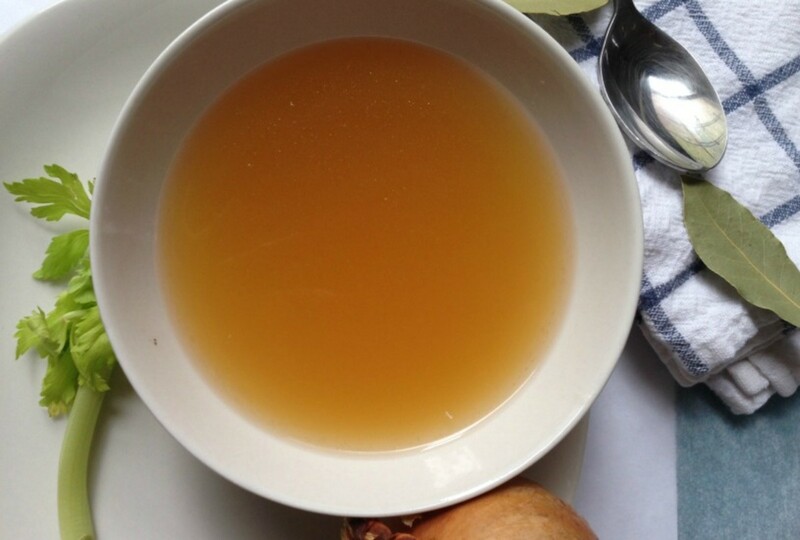 How to Use Up Your Bone Broth? Bone broths can easily be incorporated into our everyday meals. 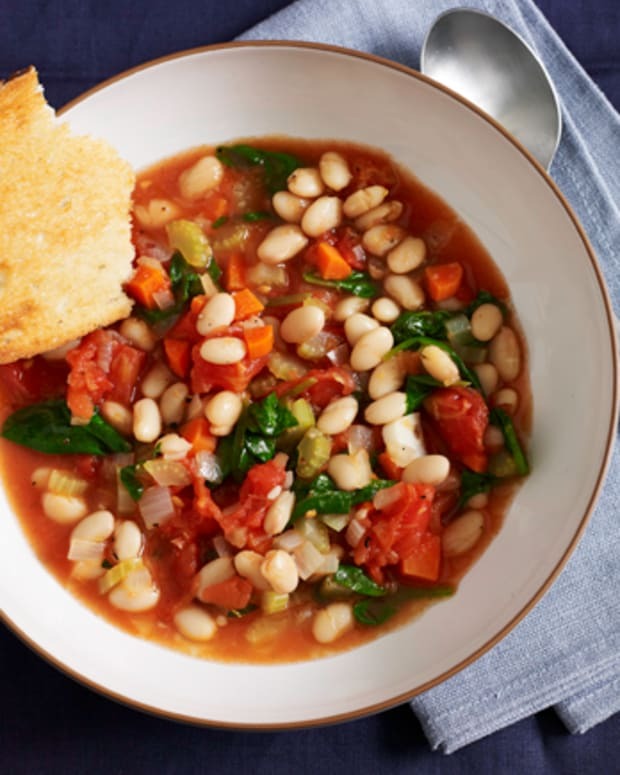 They can be used as the cooking liquid for all sorts of soups and stews, cholent, grains, vegetables, beans and pseudo-grains (like quinoa and amaranth). And you can always take advantage of them in innovative ways. 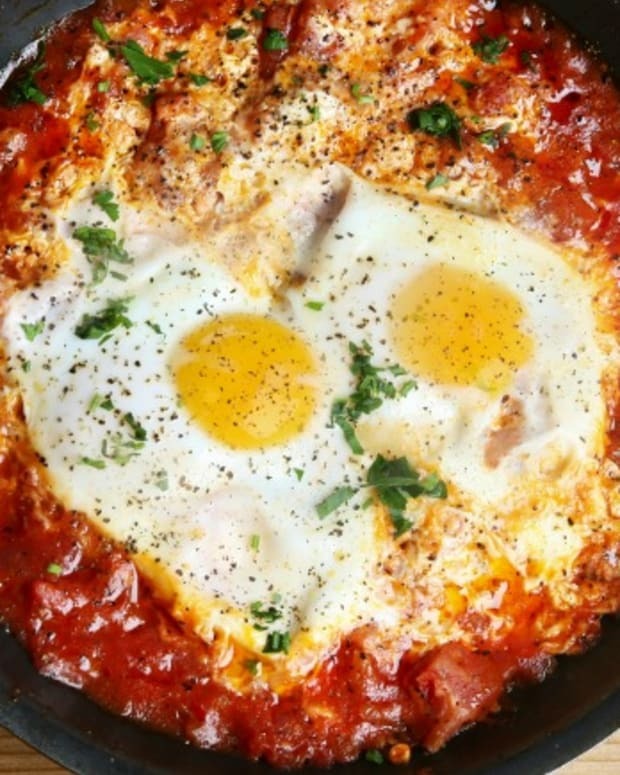 Here are some delicious suggestions to help you get your daily collagen. This recipe makes an all-purpose salad dressing that you can use on raw or cooked vegetables and/or over meat and poultry. 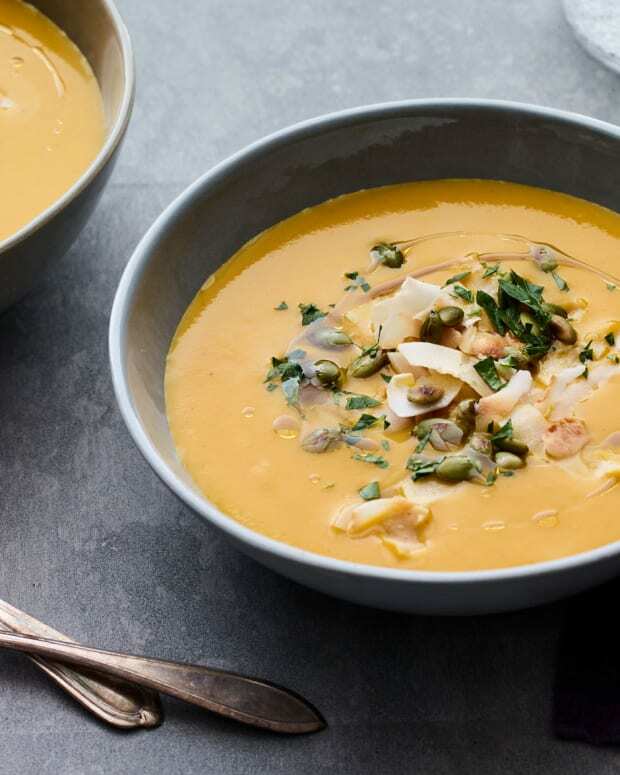 The broth super-charges the dressing nutritionally and gives it a rich umami (savory) flavor, that will make everything taste even better. 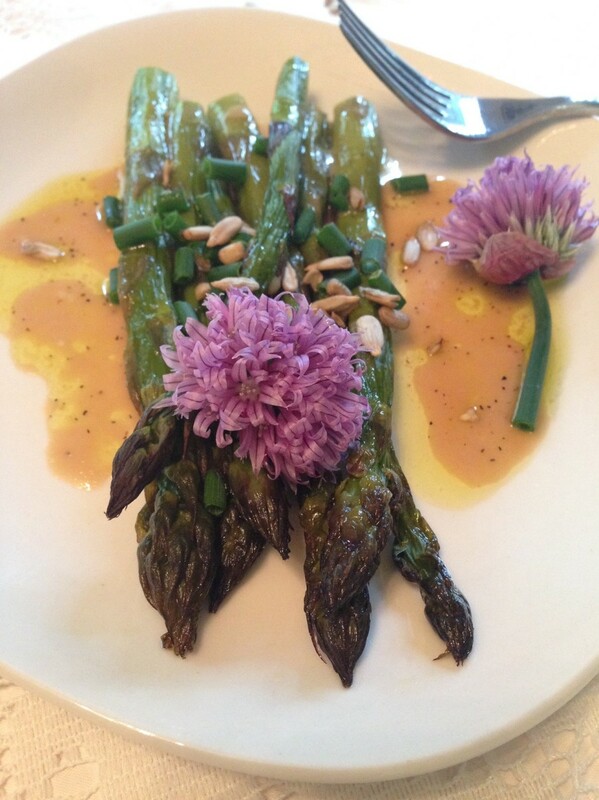 In this photograph, the dressing is drizzled over roasted asparagus and flowering chives, sprinkled with sunflower seeds.